Kentucky is famous for horse racing and has eight race tracks, but no casinos. There is always talk about adding slots, baccarat, blackjack, poker, craps, roulette and other table games to the tracks, however there are no current plans to make this a reality. For casino gambling you must visit Indiana. 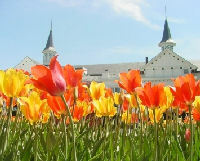 Call the Kentucky office of tourism 1-800-225-8747 or visit the official state web site www.kentuckytourism.com for additional travel information. Turfway Park Florence Turfway Park Racetrack in Florence, Kentucky features a one mile track with live thoroughbred racing on Wednesday-Sunday starting at 11:15am with simulcasting year round. Kentucky Downs Franklin Kentucky Downs in Franklin, Kentucky is a one mile horse track that features thoroughbred racing. The gates open at 10:30am daily and Kentucky Downs has two restaurants. Ellis Park Henderson Ellis Park Racetrack in Henderson, Kentucky has two tracks featuring live thoroughbred racing Wednesday-Sunday from 11am-10:30pm during July, August and September. Ellis Park has two tracks, one dirt and one turf. Keeneland Lexington Keeneland Grounds is located in Lexington, Kentucky with two tracks that feature thoroughbred racing Wendesday-Sunday 1pm-6pm. E-series terminals allow for tableside wagering. Red Mile Lexington Red Mile Racetrack has live harness racing and is located in Lexington, Kentucky. 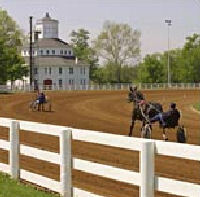 Red Mile is the second oldest harness track in the world and has a red clay, one mile track. Churchill Downs Louisville Churchill Downs Racetrack is located in Louisville, Kentucky with live horse racing on two tracks, open Wednesday-Sunday 12pm to close. Players Bluegrass Paducah Players Bluegrass Downs is located in Paducah, Kentucky and features quarter horse and harness racing Sunday 11am-6pm and Wednesday-Saturday 11am-10pm. The track is closed on Monday and Tuesday. Thunder Ridge Prestonsburg Thunder Ridge is a harness racing track located in Prestonsburg, Kentucky.